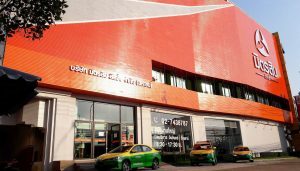 Factory – Mitsib Leasing PCL. "Factoring" means the trading of a trade account receivable by the Factor, which is responsible for the purchase of a trade receivable account in the form of a document that is used to collect the full amount of the customer. For example, batch, bill, receipt, invoice (Invoice) from the seller of goods / services. 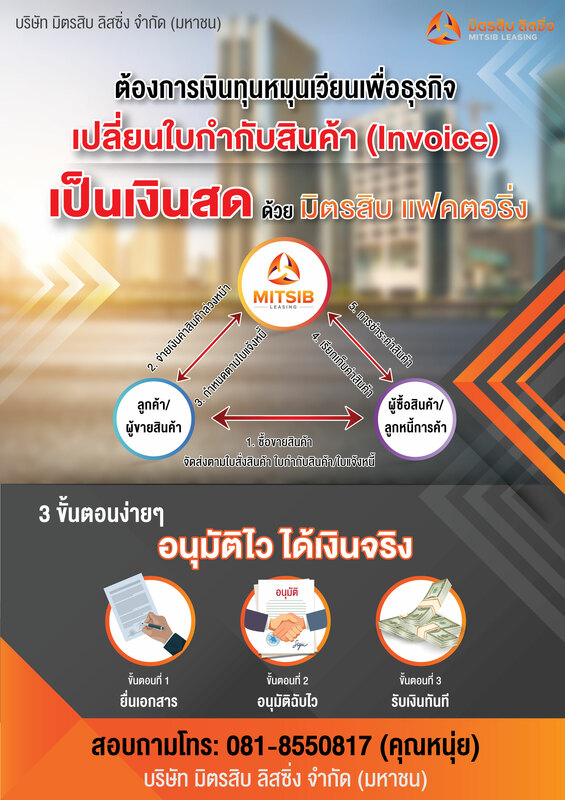 Vendor Products / Services To transfer the right of accounts receivable from the sale of goods / services in the domestic market to the Factor for the value of Invoice not exceeding 80% as agreed. The fees and interest rates in the accounts receivable management. Including operations in accounts receivable management. Collection of trade debt and take the risk that the debtor of the customer defaults. Factor has agreed to provide loans for working capital, increase liquidity of industrial operators, produce goods and services for small and medium enterprises. Disclosed Factoring is an open trade account. Trade accounts receivable will be reported to the trade account receivable. The Company will take recourse under the assignment of claim. To be able to repay debts from trade accounts receivable. The customer to sell the transfer of claims. Claiming or forcing customers to pay their debts instead of trade debtors who refuse to pay or are unable to pay their debts. For debtor, the Company will send a letter or notice. Or the customer sends the letter to consent to transfer the claim directly to the debtor. To grant debtor rights to the fully transferred receivables. 1. Get cash quickly to use in business operations within 1-3 business days. 2. No collateral required for the loan. 3. Interest can be deducted from tax expenses. 4. Can raise the limit. As the sales increase. 6. Helps to handle the receipt of payment on the bill / invoice from the account (if any).